BOOK REVIEW [[underline]]EL PLAN DE SANTA BARBARA[[end underline]] The Plan de Santa Barbara is a Chicano plan for higher education. It is recommended for all Chicano students and educators on campuses where there is a sizable number of Raza trying to cope with the Anglo educational system. The Plan is a unique plan of education in that it is applicable to most campuses where Chicanos now study, exist, live: The Anglo University. The book contains position papers on Organizing and Instituting Chicano Studies Programs, Recruitment, Curriculum Outlines, Support Programs. One of the best papers in the book is Campus Organizing and one titled, The University and the Chicano Community. 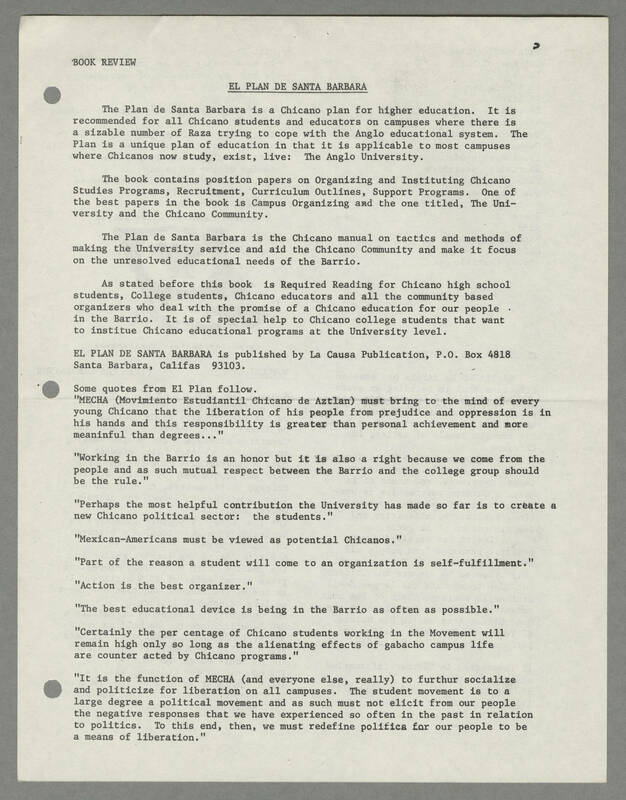 The Plan de Santa Barbara is the Chicano manual on tactics and methods of making the University service and aid the Chicano Community and make it focus on unresolved educational needs of the Barrio. As stated before this book is Required Reading for Chicano high school students, College students, Chicano educators and all the community based organizers who deal with the promise of a Chicano education for our people in the Barrio. It is of special help to Chicano college students that want to institue Chicano educational programs at the University level. EL PLAN DE SANTA BARBARA is published by La Causa Publication, P.O. Box 4818 Santa Barbara, Califas 93103. Some quotes from El Plan follow. "MECHA (Movimiento Estudiantil Chicano de Aztlan) must bring to the mind of every young Chicano that the liberation of his people from prejudice and oppression is in his hands and the responsibility is greater than personal achievement and more meaninful than degrees..." "Working in the Barrio is an honor but it is also a right because we come from the people and as such mutual respect between the Barrio and the college group should be the rule." "Perhaps the most helpful contribution the University has made so far is to create a new Chicano political sector: the students." "Mexican-Americans must be viewed as potential Chicanos." "Part of the reason a student will come to an organization is self-fulfillment." "Action is the best organizer." "The best educational device is being in the Barrio as often as possible." "Certainly the per centage of Chicano students working in the Movement will remain high only so long as the alienating effects of gabacho campus life are counter acted by the Chicano programs." "It is the function of MECHA (and everyone else, really) to further socialize and politicize for liberation on all campuses. The student movement is to a large degree a political movement and as such must not elicit from our people the negative responses that we have experienced so often in the past in relation to politics. To this end,t hen, we must redefine politics for our people to be a means of liberation."